Travel to Las Vegas With Ground Travel Specialist! Everyone loves going to Las Vegas! Whether you’re a skilled and seasoned gamer or you just love to soak up some shows and the spectacular nightlife that never seems to end, Las Vegas has something for everyone. As the city has expanded, it has become more kid-friendly over time which makes it an ideal place for a vacation with the extended family or the perfect site for a family reunion. If you’re in the Detroit area and you want to set off to Vegas, call Ground Travel Specialist today! We have a fleet of charter vehicles that make it easy to plan a trip for small and large groups of people. Our vehicles are clean and safe and our skilled drivers make even the longest trips go by in a breeze. Don’t bother fighting your way through the airport — charter a bus with GTS for a fun, easy trip! While Vegas may have had a less than wholesome origin, today it’s a worldwide magnet for all-ages fun! From exciting stage shows that the whole family can enjoy to theme parks, arcades, and unique dining experiences, Las Vegas is a place where every family will find a ton of activities that will make everyone feel like a kid again. From the circus theme of the Circus-Circus hotel and casino to the exciting roller coasters at New York, New York, Vegas is built for your family to enjoy themselves! Nearly every hotel in the city is also home to large pool facilities that will help you stay cool no matter what the temperature outside is like. While Vegas has expanded into many kid-friendly avenues, the pulsing heart of the city still revolves around the nightlife. As the sun sets and the temperatures cool, the heat of the nightlife rises. Vegas is home to some of the world’s largest dance clubs that cater to many different kinds of music. Each major hotel and casino has a stable of incredibly talented performers who strut their stuff on stage every night, and special events like boxing and one-of-a-kind performances from your favorite bands and singers are easy to come across. Contrary to the image of Las Vegas as a strip of hotels that house slot machines and all-you-can-eat buffets, the city is home to some of the highest-rated restaurants on the planet. Because Las Vegas’ clientele come from all around the world to relax and have fun, restaurants that mix cuisines from around the planet are plentiful. So while you might want to enjoy a buffet or two while you’re visiting, know that you can have a special date night where you and your special somebody can enjoy a world-class meal that you’ll be talking about for years to come. Las Vegas is home to some of the largest convention centers in the United States. Whether you’re coming to Vegas to attend a convention or you’re putting one on yourself, there is no shortage of space. Another advantage Vegas holds over other cities is that once the convention is done for the day, there are almost limitless options for enjoying one’s self at night. 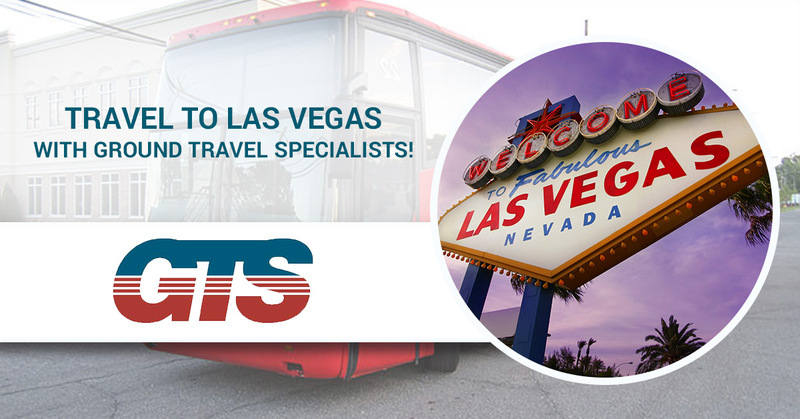 If your group wants to travel to Vegas but you don’t want to go through the hassle of coordinating flights, contact GTS today. We have a huge fleet of charter vehicles that makes traveling across the state or across the country as easy as can be! We maintain our vehicles to the highest possible standards, and all of our drivers are highly trained professionals who know how to handle any road conditions safely.